It's the most famous aria in the world. Everybody knows it - but not everybody knows what it's about. So we called in the experts from the Minnesota Opera's production of The Barber of Seville. Listen to baritone Ryan Taylor and conductor Emmanuel Plasson as they join MPR's John Birge to deconstruct Figaro. John Birge: And those words mean... "Tra la la lera"? RT: They do. (laughing) In translation, effectively, "Tra la la lera." Presto a bottega che l'alba e già! Make way for the best man in this city! Hurrying to his shop, now that it's morning! JB: So the name of the aria is "Largo al Factotum." So that's literally, "Make room for the factotum." JB: A barber, really, in the old-fashioned sense of what barbers used to do. RT: Right, right. But he also prides himself in being somewhat of a phrase-turner, a people person, putting people together, matching them up. He's a busy-body. vita pi nobile, no, non si dà. How fortunate to be so lucky! Always busy and aware of everything. Colla donetta is "first with the women," and that's when he's speaking to the young lady who's come for her wig. And then he turns to the soldier and says, "and then with the soldier... everyone needs Figaro." JB: Is that really true in the story ...? Is he inserting himself into people's lives, or are people asking him to come in? Figaro... Figaro... Figaro... Figaro... Figaro! Uno alla volta, per carit! One at a time, for pity's sake! 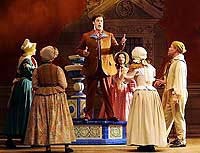 RT: Figaro is directly addressing the audience. He says, "Young men and ladies come to call me. Old people and children. Everyone needs something from me." And when you actually hear him calling his own name ... he is imitating the voices of the people around him that are constantly calling to him for help. JB: He's giving an inventory of all off the things people want from him, and when you come to this point ... it's "Enough, already!" RT: Right. And I think it's said in a rather jovial, joking tone. He says, "What a fury!" you know, "Gracious me! One a time, one at a time. Get back!" And I think he really likes the attention. Eh, Figaro! Here I am. Because I am the best man in this city! From you luck will never leave. JB: The language is incredible here. It sounds like one huge Italian tongue twister. RT: The Italians have a knack of pronouncing most of their words right up in the front of their mouth with the tip of the tongue. ... Once you get ball rolling, it's pretty easy to stay there. And as we approach the home stretch, he basically says, "It's very fortunate to be me. The last two pages here, he says, "Bravo to me! It is so fortunate to be who I am." Translation help courtesy of Melodylane.net.